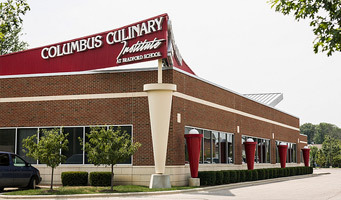 Need our address, phone number or directions to visit the Columbus Culinary Institute? The Columbus Culinary Institute is located near Easton Town Center, which is a 750,000 square foot retail center with 160 retailers, including many restaurants, and entertainment venues. Students find Easton Town Center to be a great place to play—and to find great part-time job experiences! Scroll down for directions from your area. Take Route 250 South to 71 South. Take Route 71 South to 270 East. Take the Easton exit (exit number 33). Follow to the next exit (Morse Road/Easton). Exit into the left lane. Drive to the first light and turn left onto Stelzer Road. Follow Stelzer Road for approximately 1.5 miles. Columbus Culinary Institute at Bradford School will be on your right. Take Route 33 East to 270 East. Take 71 South to 270 East. Take Route 23 South to 270 East. Take Route 4 South to Route 23 South to 270 East. Take 75 South to Route 23 South. Take 23 South to 270 East. Take Route 161 to 270 South. Take 70 East to 270 South. Turn left onto Easton Way. Take 23 North to 270 East. Take 71 North to 270 East. Take 33 West to 270 North. Take 77 South to 70 West. Take 77 North to 70 West. Follow 270 to the Easton exit (exit number 33). After exiting, proceed to the left lane. Quickly find us using a Google Map.